Original Home Health Shoulder Bag, manufactured by Hopkins Medical Products, is one of the most attractive medical bags available on the market, as it is incredibly lightweight and convenient. 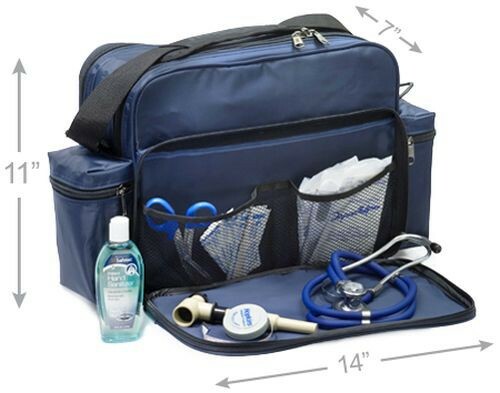 This home health bag, truly, is ideal for home use or traveling clinicians. If you're purchasing this home health bag for home use, it is perfect for first aid kit essentials, such as topical analgesics, scissors, adhesive bandages, and more. 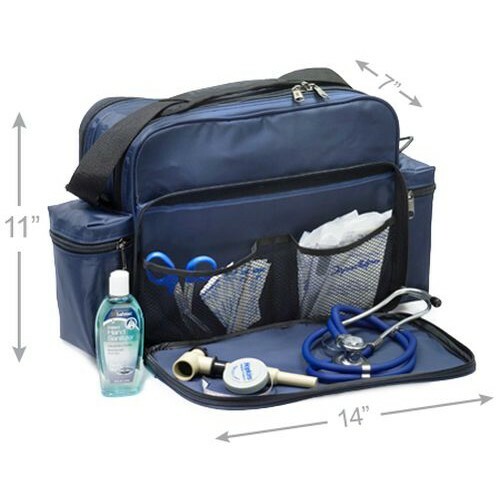 However, if you're a clinician, you can easily store a stethoscope, thermometer, and pulse oximeter, among other diagnostic equipment within this spacious, yet lightweight medical tote. If you are a traveling clinician and carry patient-sensitive information with you from time-to-time, you can also order this medical tote with a combination lock to protect your patient's privacy and security. In addition to multiple compartments, the Original Home Health Shoulder Bag features a waterproof material that is easy to clean. This medical bag also integrates a flap that you can fold down to establish a clean work space. Truly, this medical bag exceeds industry standards and clinicians' expectations. Order this medical tote today and experience why so many individuals rely on Hopkins for their portable kits. Fold down compartment to create a work space. Product Numbers: 530638 and 630639.